At that time a senior North Korean diplomat visited Moscow, and reports of the talks which took place made it clear that the Russians were pressing for the opening of bilateral negotiations between the North Koreans and the South Koreans to end the crisis. The meeting in Moscow was followed shortly after by a reciprocal visit by a Russian delegation to Pyongyang, which showed that some ground had been made in the talks in Moscow. Shortly after it became known that whilst the Russians were talking with the North Koreans the Chinese were talking with the South Koreans, whose new President – Moon Jae-in – is known to favour talks with North Korea. The talks between China and South Korea quickly bore fruit, with South Korea making clear that it would not be part of any security grouping involving the US and Japan (a sort of Asian equivalent of NATO in the north east Pacific) and that it would cap the number of US THAAD anti ballistic missile interceptors located in South Korea. The Russians and the Chinese were obviously working in concert, with the Russians negotiating with North Korea (with whom they have a longstanding and relatively cordial relationship) and the Chinese negotiating with South Korea, with whom they have very deep economic ties. The objective was to get the two Koreas talking to each other, bypassing the primary obstacle to the talks, which is the intransigent position taken throughout the Korean crisis by the US. The Russian-Chinese diplomacy bore fruit in January when over the course of his remarkably self-confident New Year Address Kim Jong-un announced an outreach to South Korea, and offered to send North Korean athletes to participate alongside South Korea’s athletes in a joint Korean Olympic team at the Winter Olympics in PyeongChang. South Korean President Moon responded positively to Kim Jong-un’s offer, the two Koreas did indeed participate together in the PyeongChang Winter Olympics by fielding a joint team – something which incidentally caused some controversy in South Korea – and under cover of the PyeongChang Winter Olympics a series of meetings then took place between President Moon and his officials and North Korean officials, who importantly included Kim Jong-un’s sister Kim Yo-jong. This opened the way for a further intensification of the dialogue between the two Koreas, with the recent visit of North Korea’s intelligence chief to Seoul and the visit of a South Korean delegation to Pyongyang, where it met publicly with Kim Jong-un. The result of these talks is an agreement between the North Koreans and the South Koreans for a summit meeting between Kim Jong-un and Moon Jae-in in April in the Demilitarised Zone which separates the two Koreas. In order to improve the atmosphere in advance of the summit Kim Jong-un apparently told the South Korean delegation that ‘denuclearisation’ would be the subject of the talks, and that North Korea would conduct no further tests either of its nuclear weapons or of its ballistic missiles in the lead up to the summit, even if the US and South Korea pressed ahead with their planned exercises in the Korean Peninsula. Kim Jong-un also apparently told the South Koreans that in return for ‘denuclearisation’ the North Koreans would be looking for firm security guarantees. Kim Jong Un, chairman of the Workers’ Party of Korea (WPK), chairman of the State Affairs Commission of the DPRK and supreme commander of the Korean People’s Army, received the members of a delegation of special envoy of the south Korean president who arrived in Pyongyang on Mar. 5. Present there were Jong Ui Yong, chief of the State Security Office of Chongwadae who is special envoy of President Moon Jae In; So Hun, director of the National Intelligence Service; Chon Hae Song, vice-minister of Unification; Kim Sang Gyun, vice-director of the National Intelligence Service; and Yun Kon Yong, chief of the State Affairs Office of Chongwadae. Kim Yong Chol, vice-chairman of the Central Committee of the WPK, and Kim Yo Jong, first vice department director of the Central Committee of the WPK were on hand. Shaking hands of the special envoy and his party one by one, respected Supreme Leader Kim Jong Un warmly welcomed them to Pyongyang. Jong Ui Yong courteously conveyed a personal letter of President Moon Jae In to the Supreme Leader. The members of the special envoy delegation presented gratitude to the Supreme Leader for having dispatched high-level delegations and various large-scale delegations with the 23rd Winter Olympics as a momentum to ensure its successful holding. Expressing thanks for this, Kim Jong Un said it is natural to share the joy over an auspicious event of fellow countrymen of the same blood and help them. The recent Winter Olympics served as a very important occasion in displaying the stamina and prestige of our nation and providing a good atmosphere of reconciliation, unity and dialogue between the north and the south, he added. Then he had an openhearted talk with the south side’s special envoy delegation over the matters arising in actively improving the north-south relations and ensuring peace and stability on the Korean Peninsula. He repeatedly clarified that it is our consistent and principled stand and his fixed will to vigorously advance the north-south relations and write a new history of national reunification by the concerted efforts of our nation to be proud of in the world. After being told about President Moon Jae In’s intention for a summit by the special envoy of the south side, the Supreme Leader exchanged views and reached a satisfactory agreement. He gave an important instruction to the relevant field to rapidly take practical steps for it. He also had an exchange of in-depth views on the issues for easing the acute military tensions on the Korean Peninsula and activating the versatile dialogue, contact, cooperation and exchange between the north and the south. The talk proceeded in a compatriotic and sincere atmosphere. Kim Jong Un had a photo session with the members of the delegation. Simultaneously with this meeting, in which Kim Jong-un made clear his wish for a rapprochement with South Korea, Rodong Sinmum published these two very interesting commentaries about the reasons for North Korea’s possession of nuclear weapons and ballistic missiles. The nuclear issue of the Korean peninsula came into being and reached the present point, entirely due to the U.S., and thus, the U.S. should bear full responsibility for it. The nuclear issue of the Korean peninsula would not have been brought up at all, if there had not been anti-DPRK hostile policy pursued by the U.S. from the first day of the foundation of the DPRKand if the hostile policy had not been developed to take the form of undisguised nuclear blackmail and threats against the DPRK…. Our state nuclear force serves as strong deterrent to any nuclear threat and reckless military provocation of the U.S., and therefore, it will never pose threat to any country or region unless they infringe upon the sovereignty and interests of the DPRK. Historically the U.S. has posed nuclear threat and blackmail to the DPRK for several decades after adopting it as a policy to mount nuclear attack on the DPRK. In the present century its nuclear threat and blackmail against the DPRK have got more frantic. There was no other option for the DPRK in the phase of acute confrontation in which it had to protect its system and destiny of the nation in one-on-one showdown with the world’s biggest nuclear possessor U.S. We openly and squarely possessed nuclear weapons to defend the supreme interests of the country from the U.S. nuclear threats. We have scuttled all the nuclear attack operation scenarios of the U.S. which tried to drive the Korean nation into nuclear disaster with hysteric war games. We have drastically weakened its unchallenged position in the world. Peace and security on the Korean Peninsula, Northeast Asia and the rest of the world have been reliably guaranteed by the DPRK’s bolstering of nuclear deterrent. The DPRK has defended the world peace and security by single-handedly frustrating the U.S. reckless nuclear moves to stifle it by force and dominate the world. Its feats deserve the praise of the world. Both commentaries make the purpose of the North Korean ballistic missile and nuclear weapons programme absolutely clear: it is to deter the US from launching another one of its regime change wars against North Korea. The North Koreans perceive a threat to themselves from the US. Their nuclear weapons and ballistic missiles are intended to deter the US from attacking them. North Korea says its possession of a strategic nuclear deterrent has no other purpose, and as Kim Jong-un’s words to the South Koreans show, North Korea has no intention of attacking South Korea, and its strategic nuclear deterrent is not intended to provide cover for a North Korean attack on South Korea, as some US commentators claim. The North Koreans have been making these points for years, in fact ever since their nuclear weapons and ballistic missile programme was launched back in the early 1990s. I would add that proposals for the peaceful reunification of the two Koreas by North Korea’s founder and first Great Leader Kim Il-song going all the way back to the late 1970s show that already back then the North Koreans had given up any idea of attacking South Korea in order to unite the two Koreas by force. I would here add my own view of North Korea’s conventional military, which is that it both can and will determinedly and successfully defend North Korea from an invasion by the US and South Korea if such an invasion is ever launched. In my opinion, and contrary to what is often said, the North Korean military has both the weapons and the technology and above all the training and the motivation to do this. However the configuration of the North Korean military – above all its lack of an effective air force as opposed to its increasingly sophisticated air defence system – means that it is incapable of invading and occupying South Korea. If North Korea’s strategic nuclear forces are intended to deter a US attack on North Korea, what would Kim Jong-un accept in return for agreeing either to limit them or to do away with them? The South Koreans have said that Kim Jong-un has spoken of possible ‘denuclearisation’ in return for security guarantees. What does he mean by this and what ‘security guarantees’ might he have in mind? North Korea has not always sought security through nuclear deterrence. The North Koreans placed themselves under the Soviet nuclear umbrella back in the 1960s when they gave up their first (unrealistic) plans to develop their own nuclear weapons at that time in return for a Soviet security guarantee and for Soviet help with their civilian nuclear programme. When however it became clear in 1989 that the USSR would not prevent the collapse of the Communist governments which it had supported in eastern Europe, the North Koreans concluded – correctly – that the security guarantee which the USSR had given them had become worthless. North Korea’s decision to relaunch its nuclear weapons programme dates from that time, though its development was delayed first by North Korea’s 1990s economic crisis (caused by the withdrawal of Soviet aid) and then by North Korea’s ultimately fruitless attempts to negotiation security guarantees with the US. Recently the Russians and the Chinese have said that they would be prepared to give the North Koreans security guarantees again, and as I have discussed previously, in August China’s semi-official newspaper Global Times confirmed that China would come to North Korea’s defence if North Korea were invaded by the US. This Chinese guarantee is however of only an informal nature, though Article 2 of the Chinese-North Korean Mutual Aid and Cooperation Treaty of 1961 – which remains in force – declares that China and North Korea will undertake “all necessary measures to oppose any country or coalition of countries that might attack either nation”. North Korea will undoubtedly be looking to firm up this rather vague guarantee as part of any comprehensive agreement for the denuclearisation of the Korean Peninsula. The North Koreans will anyway be reluctant to rely exclusively on a guarantee from China. A consistent feature of North Korean policy – especially since Kim Jong-un became North Korea’s Great Leader – is for North Korea to do all it can to avoid over-dependence on China. From the North Korean perspective China is the colossus which at various times in Korean history has sought to conquer or dominate Korea. The whole point of North Korea’s Juche (self-reliance) ideology is to reduce North Korea’s dependence on China, which if allowed to go unchecked has the potential to turn North Korea into an economic province of China and a political satellite of China. From the perspective of North Korea’s ultra-nationalist leadership that is unacceptable, and asserting North Korea’s independence from China is almost as great a priority for them as asserting North Korea’s independence from the US. Beyond this the lesson of the failure of the Soviet guarantee North Korea was given in the 1960s, and of China’s willingness to go along with US demands for UN sanctions against North Korea, is that it is dangerous for North Korea to rely for its security on guarantees given to it by Russia and China. In the case of Russia there is the further factor that whilst the North Koreans have historically had a closer relationship with Russia than with China – it has only recently come to be known how close political and economic connections between North Korea and the USSR once were – the North Koreans are realistic enough to know that Russia unlike China lacks both the will and the conventional forces in the region to defend North Korea in the event that it is attacked by the US. It is in fact inconceivable that Russia would risk going to war with the US – risking nuclear war in the process – on North Korea’s behalf. North Korea is a country most Russians know very little about and have no strong emotional connection to. There would be massive opposition in Russia if Russia were to risk nuclear war with the US on North Korea’s behalf, and no one of importance in Russia is suggesting it. By contrast China’s millennial history of intense interaction with Korea means that for China North Korea most definitely does matter, so that a Chinese reaction to a US invasion of North Korea would be extremely strong. Though North Korea will therefore look for a security guarantee from Russia, just as it will look for a security guarantee from China, if it is going to ‘denuclearise’ realistically it must seek security guarantees from South Korea and – if it can get them – from the US. However given the extreme distrust which now exists between North Korea and the US, North Korea will insist that whatever security guarantees the US offers must be accompanied by concrete steps to complement both its security guarantees and North Korea’s own denuclearisation. There is no secret as to what these concrete steps the North Koreans want are; the North Koreans have spoken about them many times. They are the withdrawal of all US forces and of US nuclear weapons from South Korea. In other words the North Korean conception of ‘denuclearisation’ involves a comprehensive treaty, in which North Korea agrees to give up its nuclear and ballistic missile forces in return for (1) security guarantees from Russia and China; (2) the withdrawal of US forces and nuclear weapons from South Korea and a US pledge not to attack North Korea; and (3) some sort of deconfliction or non-aggression agreement with South Korea, with a commitment from South Korea to work together with North Korea on steps to overcome the division of the Korean nation and of the Korean Peninsula. The latter point needs to be explained, since it is contrary to the understanding of the Korean conflict which most have in the West. Briefly, though the fact is still widely disputed in both the West and South Korea, academic scholarship now generally accepts that Kim Il-song – the founder of the North Korea state – was indeed as the North Koreans have always said an important and possibly the most important Korean resistance leader fighting the Japanese during the period of Japan’s occupation of Korea. When with Soviet support Kim Il-song established his government in Pyongyang immediately following Japan’s defeat in the Second World War, he did not envisage that his government would be the government of just North Korea. Rather – since he saw himself as the leader of the Korean people in their struggle for independence against the Japanese – he saw himself as the leader of the entire Korean nation, and his government as the rightful and legitimate government of the whole of Korea. By contrast Kim Il-song considered the South Korean government established with the support of the US in South Korea following the end of the Second World War to be a puppet government created by the US in order to perpetuate what Kim Il-song saw as the US’s occupation of South Korea. This remains the North Korean position to this day, and is reflected in North Korea’s political rhetoric. The principal reason for the passionate loyalty North Koreans feel towards Kim Il-song’s family is because they accept – or have been taught to accept – this account of their state’s origins. They therefore accept their government as the true legitimate government of Korea dedicated to achieving the independence and unity of the Korean nation. In accordance with Confucian notions of filial piety – still exceptionally strong in both Koreas – preserving the nation’s leadership in Kim Il-song’s family is the guarantee that his mission – to unite and liberate Korea from its foreign occupiers – will be continued and will eventually triumph after his lifetime. This is obviously a completely different situation from the one which existed in Germany following the end of the Second World War. The East German government – created in what was once the Soviet occupation zone – never considered itself to be the legitimate government of Germany. For that reason it never fully achieved legitimacy amongst the East German people. This difference in perspective explains the fundamental differences in the approach to the division of their country by the North Korean government and by the former East German government. In contrast to the situation in pre-1989 Germany – where it was the West German government which always sought unification with East Germany, and where it was the East German government which always resisted it – in Korea the situation is the reverse. It is North Korea which continuously makes proposals for unification, and it is South Korea which always resists them. It is this widespread acceptance in North Korea of the legitimacy of the North Korean government and of the rightness of the rule of Kim Il-song’s family which together with the tough repression which unquestionably takes place there explains the extraordinary resilience of North Korea in the face of intense external pressure. For Kim Jong-un and his officials steps towards a full rapprochement of the two Koreas leading to eventual reunification are therefore an essential precondition for an eventual settlement of the Korean conflict. As long ago as the 1970s Kim Il-song realised that this could not take the form of a simple merger of the two Koreas under his government. He therefore proposed a loose confederal structure – a form of “one country, two systems” – and that remains North Korea’s objective to this day. It is this outlook which explains Kim Jong-un’s constant references to reunification whenever the question of North Korea’s nuclear weapons and ballistic missiles comes up. …….it is our consistent and principled stand and his fixed will to vigorously advance the north-south relations and write a new history of national reunification by the concerted efforts of our nation to be proud of in the world. It is because (1) North Korea cannot simply be satisfied with security guarantees from Russia and China in return for its own denuclearisation; and (2) because withdrawal of US forces and nuclear weapons from the Korean Peninsula and the eventual reunification of the Korean Peninsula and of the Korean nation can only take place with the agreement of the South Korean government, that Kim Jong-un is talking to the South Korean government, and is prepared to talk at South Korea’s insistence to South Korea’s ally the US. That explains Kim Jong-un’s agreement to the South Korean proposal for a summit meeting between him and President Trump. At that summit meeting he will be looking to advance the objective which North Korea has had since the 1970s: a formal treaty ending the Korean war, with guarantees for North Korea’s security provided by all three Great Powers – the US, China and Russia – with all US forces and nuclear weapons removed from the Korea Peninsula,and with an agreed framework for steps towards eventual Korean reunification in some form of confederal structure as North Korea has been proposing since the 1970s. The big question is how far Donald Trump is aware of any of this, and to what extent he is even capable of delivering on it if he eventually decides that it is in the US interest to accept it? Frankly, I doubt that President Trump is aware of it. Moreover the recent forced departure from the State Department and the National Security Council of Joseph Yun and Victor Cha – the US government’s two experts on Korean issues, who certainly were aware of it – means that it is doubtful that there is anyone else in a senior position in the US government who is fully aware of it either. Already one gets the impression that President Trump and other members of his administration believe that Kim Jong-un’s openings to South Korea and his agreement to the South Korean proposal for a summit meeting between himself and President Trump are not a sign of strength resulting from North Korea’s successful acquisition of strategic nuclear weapons, but are a sign of weakness brought about by the US’s escalating sanctions pressure on North Korea. Inevitably this seems to be encouraging the US administration to take the hardest possible line under the dangerously mistaken impression that it can achieve North Korea’s unilateral nuclear disarmament that way whilst giving nothing away in return. A climate favourable for national reconciliation and reunificationshould be established. The improvement of inter-Korean relations is a pressing matter of concern not only to the authorities but to all other Koreans, and it is a crucial task to be carried out through a concerted effort by the entire nation. The north and the south should promote bilateral contact, travel, cooperation and exchange on a broad scale to remove mutual misunderstanding and distrust, and fulfil their responsibility and role as he motive force of national reunification. Even if President Trump and the US do eventually come to understand Kim Jong-un’s intentions, it is not at all clear that they will willingly go along with them. 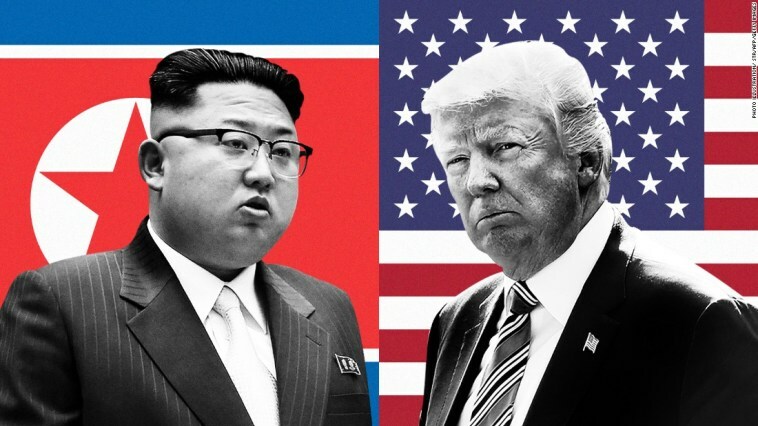 The idea of giving Kim Jong-un what he wants – a US withdrawal from the Korean Peninsula, a security treaty, and the peaceful establishment of some form of Korean confederation – will certainly balk with a lot of people in the US. Vice-President Pence’s sulky behaviour at the PyeongChang Games, and the threats against North Korea coming from the likes of Senator Lindsay Graham, General H.R. McMaster and – from time to time – from President Trump himself, show the huge obstacles in the way of a settlement. Nonetheless President Trump now has an immense opportunity before him. The outlines of a settlement of the Korean conflict are there, and there is now the first traces of a road map to achieving it. Moreover a comprehensive settlement of the Korean conflict along the lines of what Kim Jong-un is proposing – and which the South Koreans look increasingly tempted to accept – can in no sense be considered disadvantageous to the US. The US can only benefit economically and in security terms from the easing of tensions and the denuclearisation and reunification of the Korean Peninsula. President Trump claims to be a deal maker par excellence. Whether or not he realises it he is now being offered the deal of his lifetime. In his own interests and in the interests of the US he should seize it. By now it should be obvious that the alternatives – waiting for the North Korean government to collapse under the sanctions pressure, or attacking North Korea to ‘disarm’ it – risk catastrophic failure and cannot work. Moreover If he does not make the deal, then President Trump risks the possibility that the two Koreas will make the deal without him. Already he and his administration admit they were taken aback by a diplomatic initiative which they did not expect, and which was agreed in talks between the North Koreans and the South Koreans which they did not want and in which they were not a party.